The resurgence of indie games certainly benefited some genres more than others. The horror genre in particular got a lot of attention and Ebb Software is yet another developer to enter this particular fray with Scorn. The game, now on Steam Greenlight for approval, is described as an atmospheric first person horror adventure set in a nightmarish universe of “odd forms and somber tapestry”. 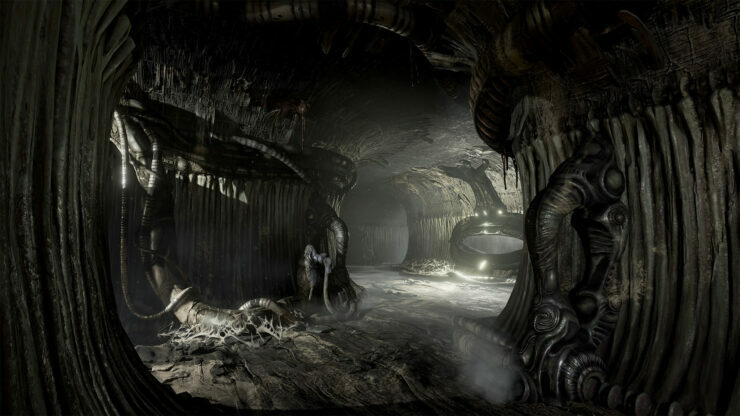 Players will be thrown into this world, which can be explored in a non-linear way; each location will have a theme with certain characters and puzzles. -Cohesive “lived in” world – Scorn takes place in an open-ended world with different interconnected regions. Each region is a maze like structure with various rooms and paths to discover .All the storytelling happens in-game, with no cut-scenes to distract you from the grisly reality of the living, breathing world you’re in. But keep your eyes open – the game won’t show you any sympathy if you miss something important on your uneasy travels. Everything has a reason and purpose – you just need to work out what it is. -Full body awareness – player will experience better immersion being aware of the character’s body and movement. Interaction with the world is realistic – objects are picked up with your hands (instead of just floating in midair), machines and instruments are operated by grabbing the controls etc. -Inventory and ammo management – is defined and limited. It plays a big role in keeping the player in an even greater state of awareness throughout the whole game. Players will have to think about when to fight and when to take cover and how their actions affect the world around them. Different play styles will be needed to advance. According to Ebb Software, Scorn will be split in two parts with the first one coming in 2017 to PC. Check out the teaser trailer below.